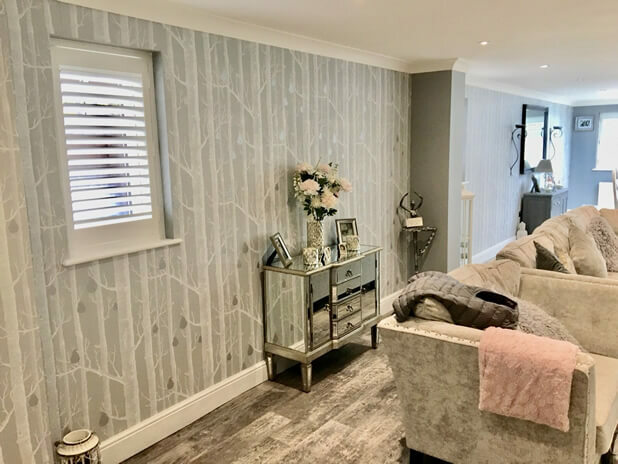 Thomas was in Greenhithe, a village located in Darford, Kent to fit multiple plantation shutters to the living area of this home. 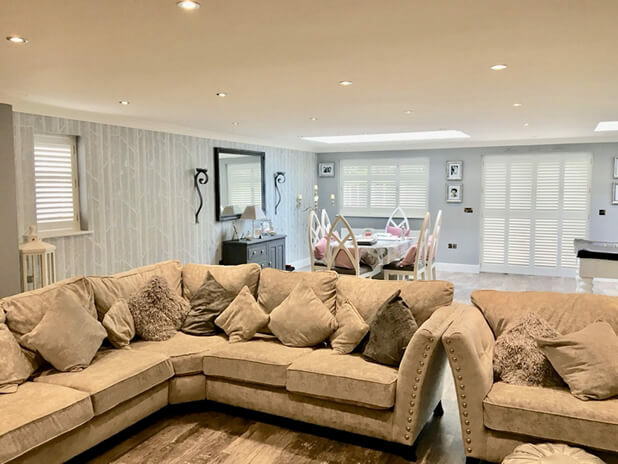 Kerry was looking for shutters throughout the room which included a mixture of smaller and larger windows and also a door area leading outside. 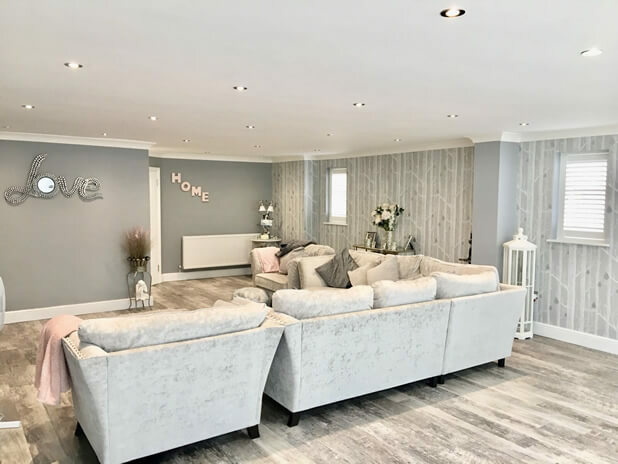 The room had a lovely look and feel to it, currently used as a living area also with a dining table and pool table! Our shutters would help add the finishing touches to this great area. 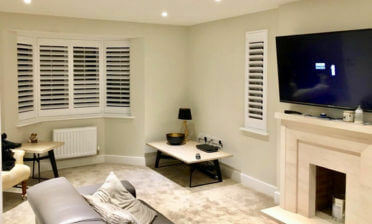 The smaller windows were fitted with standard, 1 panel, modern full height shutters with the larger windows featuring the same, but with 3 panels and a mid rail. The mid rail allows for not only more strength, but further adjustment to the louvres and also a way of matching the window lines behind. 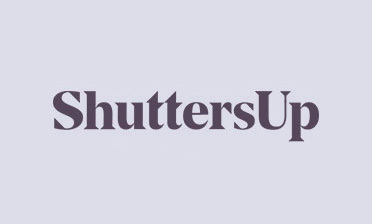 The doors feature top to bottom full height shutters with a central mid rail, again for strength but also adjusting privacy at the lower and top level of the shutters. You will also notice that this mid rail also lines up with the bottom of the window shutters to the left and right. 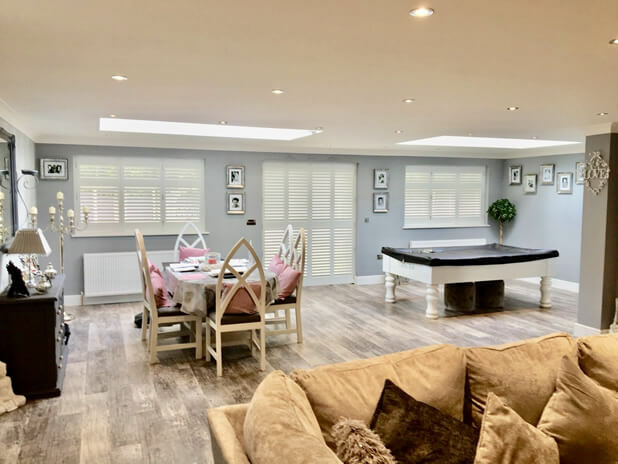 All shutters have deep plain L frames and feature 63mm louvres with hidden tilt rod systems, creating a clean/modern look throughout the install. They are created from our Fiji range and finished in a lovely pure white with nickel hinges, which looks great against the rooms décor no matter where they have been placed.